North Beach, no longer a diamond in the rough. What is so special about North Beach? North Shore Open Space Park is an oceanfront public space that encompasses close to 28 acres of land starting at 78th street and continuing north until the end of the city limits at 87th Ter. This Miami Beach treasure is about to undergo a $6M dollar renovation. The beauty of this public space is the native tree canopy, jogging/biking trails, barbecue & picnic areas, party pavilions, fitness stations, and direct beach access! Parallel to the park you will also find the "Atlantic Greenway" a Beachwalk that will eventually connect all three districts of the city. Once completed, the corridor will serve as an uninterrupted paved, multi-use trail for pedestrians and non-motorized vehicles, which will promote alternative transportation methods. Thus, allowing residents and visitors to bike, walk, run, jog, rollerblade (you get the idea) from North Beach all the way to South Beach. In addition to North Shore Open Space, we have North Shore Park & Youth Center, a state-of-the-art recreational facility with programs for all ages to enjoy. The park has Tennis courts, both hard and clay surfaces, a baseball diamond, batting cage, playground facilities and many festivals throughout the year for residents to enjoy! Just a few blocks away is Normandy Shores Park where you can play a full 18 holes of golf, there are tennis courts, playground facilities, and soccer fields. And just when you thought there couldn't possibly be more, let me introduce you to Normandy Isle Park and Pool. This beautifully landscaped, and recently renovated park includes a community pool center as well as a gated park element. The park features three multipurpose basketball courts, a heated, 4 lane lap pool, interactive play pool for children, tot lot, expansive soccer field, and shaded pavilion which can be rented for private celebrations. Full lighting allows night play at the tot lot, basketball courts, and soccer field. There are a few more parks not mentioned, I don't want to brag too much! Since North Beach has remained relatively untouched for many years, the area is ready for redevelopment and improvements. 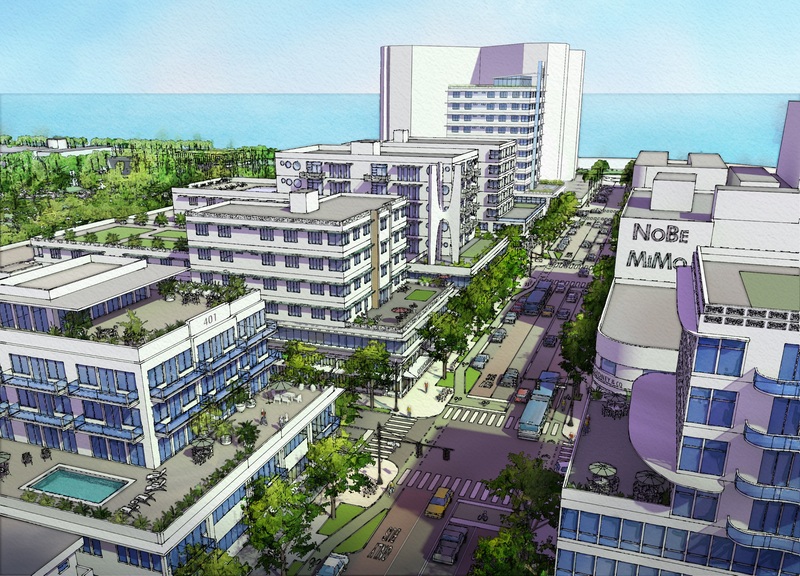 The Master Plan for the North Beach Business District (rendering above) has been approved by voters. The Master Plan will be guided by "Five Big Ideas" to create a Town Center, provide more mobility options, protect & enhance neighborhoods, better utilize public land and build to last. One of the approved projects I am eager to see come to fruition is the conversion of the "West Lots". The West lots consist of 8 contiguous parcels of city-owned land, which stretches over more than 370,000 square feet between 79th Street and 87th Street across from North Beach Open Space Park. One of these parcels located at 81st Street and Collins Ave. will be turned into North Beach's version of Wynwood Yard. The outdoor gathering space will offer a minimum of seven cultural and community events each week at no charge. They will include urban farming classes, live local music, nonprofit events, cooking workshops and fitness classes, among other activities. Providing a place for residents and visitors to interact with food trucks, outdoor music shows, and garden spaces. This element of the plan is fully approved and I will be the first one there! North Beach has long been a diamond in the rough and the most affordable district in Miami Beach. This is all expected to change as a result of the planned improvements to the area. North Beach has many waterfront, gated neighborhoods with single-family homes, townhomes, and condos to choose from. As an expert and longtime resident, I can give you a guided tour and detailed information on the amazing Miami Beach Neighborhood we call NOBE.